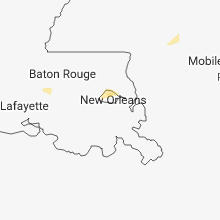 2:55 PM EST Quarter sized hail reported near Ashburn, GA, 49.2 miles WNW of Douglas, GA, quarter size hail reported in ashburn georgia. 3:10 PM EST Golf Ball sized hail reported near Rebecca, GA, 43.6 miles WNW of Douglas, GA, golf ball sized hail reported sw of rebecca. quarter and golf ball size hail covered and accumulated on highway 112. 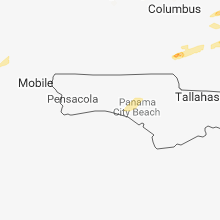 3:10 PM EST Quarter sized hail reported near Blakely, GA, 75.7 miles NNW of Tallahassee, FL, quarter size hail at the 911 center at the early county sheriffs office. 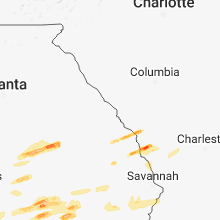 3:39 PM EST Quarter sized hail reported near Portal, GA, 58.4 miles WNW of Savannah, GA, a picture on facebook was relayed by the broadcast media of hail up to the size of quarters in portal. 4:04 PM EST Golf Ball sized hail reported near Fitzgerald, GA, 34.6 miles WNW of Douglas, GA, golf ball sized hail reported. 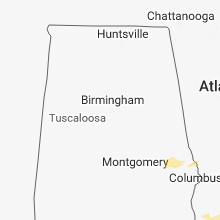 4:10 PM EST Ping Pong Ball sized hail reported near Chula, GA, 41.4 miles W of Douglas, GA, accumulated quarter to ping pong size hail on interstate 75 between exits 67 and 69. hail accumulated up to an inch on the side of a road. 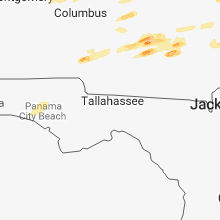 4:10 PM EST Quarter sized hail reported near Ocilla, GA, 31.5 miles W of Douglas, GA, quarter size hail reported in the pleasure lake area. 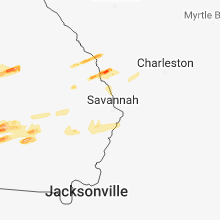 4:30 PM EST Quarter sized hail reported near Sylvania, GA, 47.8 miles NNW of Savannah, GA, screven 911 center reported quarter size hail near poor robin rd. and hwy 24. 4:34 PM EST Quarter sized hail reported near Alapaha, GA, 24.2 miles WSW of Douglas, GA, tree down blocking 129 n and quarter size hail. 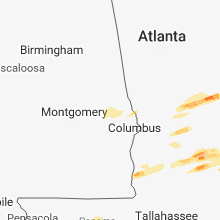 4:50 PM EST Quarter sized hail reported near Ashburn, GA, 49.2 miles WNW of Douglas, GA, quarter size hail in ashburn georgia. 5:02 PM EST Quarter sized hail reported near Douglas, GA, 3.1 miles NNW of Douglas, GA, media relayed a photo on social media of quarter size hail in douglas... ga at coffee high school. 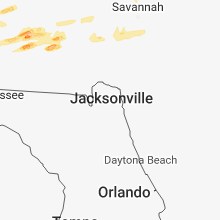 time estimated by radar. 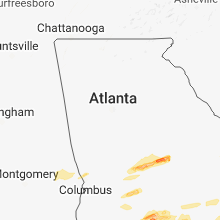 5:02 PM EST Quarter sized hail reported near Douglas, GA, 0.3 miles N of Douglas, GA, media relayed a photo on social media of quarter size hail in douglas... ga. time estimated by radar. 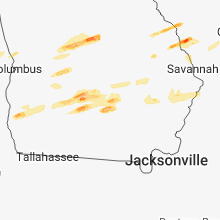 5:17 PM EST Quarter sized hail reported near Reidsville, GA, 59.2 miles W of Savannah, GA, tattnall county 911 call center reported that hail the size of quarters fell at the office.